An Omron Pedometer is a device you clip to your belt to keep track of the steps taken throughout the day. People keep track of the distance during cardio workouts such as running and walking to calculate the amount of calories burned. However, a pedometer can be used to keep track of the steps taken that aren't part of a workout. This helps determine how many calories are burned during the day even while taking steps in an office instead of on a treadmill. The pedometer is a small device that benefits people who are trying to lose weight and count calories. Measure your stride length. Place the tape measure on the floor. 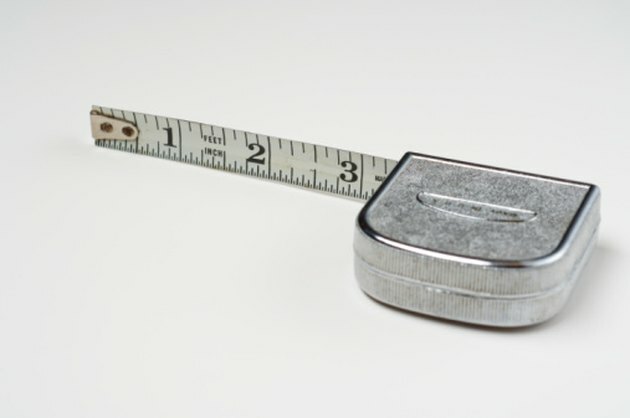 Place both feet at the beginning of the tape measure and take a step forward. The distance between the heal on the heal from one foot to the other is your stride length. Enter this value into your pedometer. Clip the pedometer to your belt. Take a few steps around the house or the office to test the pedometer's accuracy. The pedometer should detect each step taken and show it on the display. Keep the pedometer clipped to your belt as you walk around throughout the day. It's important to keep the pedometer clipped to your belt, so you can properly detect how many steps are taken during the day. View the pedometer's total steps calculated at the end of the day. The pedometer continues to calculate your total steps during a shopping trip, for each step taken in the office, and even during workout sessions. The number of steps taken can determine how many calories are burned. For every 2,000 steps taken, calculate one mile walked. For every one mile walked, 100 calories are burned. Harvard estimates that for every mile walked, approximately 200 calories are burned.